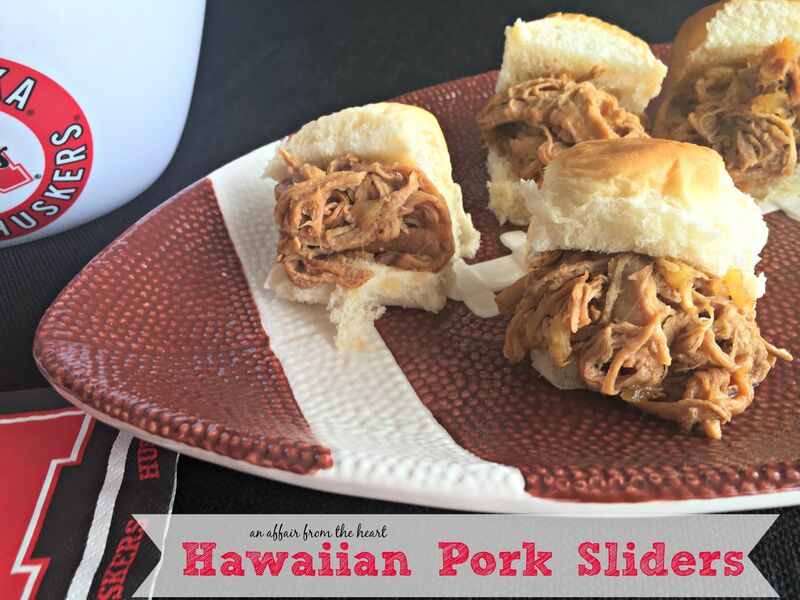 Sweet Hawaiian barbecue, pineapple and teriyaki served on a Hawaiian roll, perfect for tailgating or entertaining! I love fall for so many reasons. Warm sunshine with that crisp breeze only autumn can provide, the crunch of leaves, the changing of the colors, the flavors of spice, apple and pumpkin, soups and stews, jeans and sweatshirts and FOOTBALL! I have been a Nebraska Cornhusker fan my whole life. Born and bred. My hubby on the other hand, was born across the river in Iowa and much to his Iowa State loving parents, has also always been a die hard Husker football fan. Now we have another reason to love it, our oldest is a Junior at the university, and trips to Lincoln mean that we get to see him! We have season tickets, and love to tailgate. We always put out a big spread of food, he comes with his buddies and fraternity brothers to our tailgates to eat and get prepped to cheer on our team. I am known for trying to come up with food or a signature cocktail that has a theme for who we are playing that week, or the goings on. Like last year when we played Miami — I made a signature cocktail “The Frozen Hurricane Slush.” you know…to freeze out Miami. 😉 Or the year we played on Halloween and I made Go Big RedRum RedRum Punch! 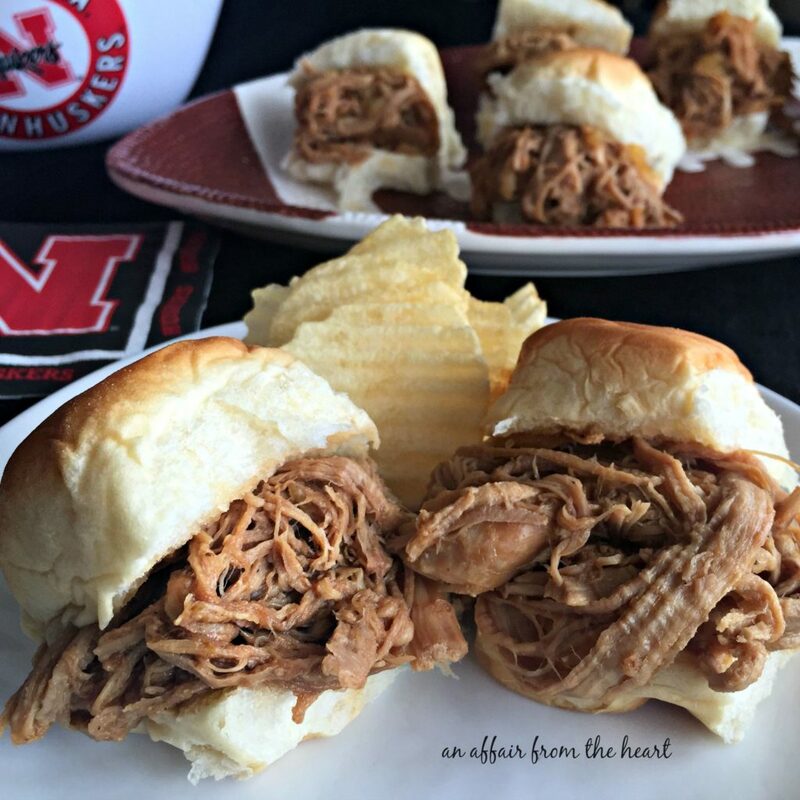 I have been trying to build up my tailgating recipes on my website this year, and when the head of The Secret Recipe Club asked if I would like to participate in a Tailgate Themed Recipe swap, I couldn’t wait to sign up! You see, I post the second Monday of the month with my group for the SRC, and there are four groups. We decided to have a themed swap between all of the groups on the months that have 5 Mondays! Great idea, right? It’s fun to be able to “meet” and cook/bake from other members of other groups. I was assigned the blog Turnips 2 Tangerines. Lynn hosts this delicious blog from her home in Wisconsin, where she was born and raised. Married to her Junior High School sweetheart, she has enjoyed cooking her whole life. She is pretty adventurous in the kitchen, and you will enjoy her wide array of recipes. I was on a mission to find something “tailgating” but I am sure I will be back to browse through with a whole new mind set. My first stop will be her Crock Pot Apple Pie Oatmeal, and next I am making her 24 Hour Salad! I had to make a few changes to Lynn’s recipe, based on the availability of the ingredients I could find here. I am so excited with how these turned out, we had leftovers, and I froze them and sent them down to school with my son to eat later on. He was happy about that! Place pork roast in your crock pot, pour brown sugar over the top. Add the rest of the ingredients (minus the rolls) to the crock pot. Cover and set to low. Cook for 8 hours. 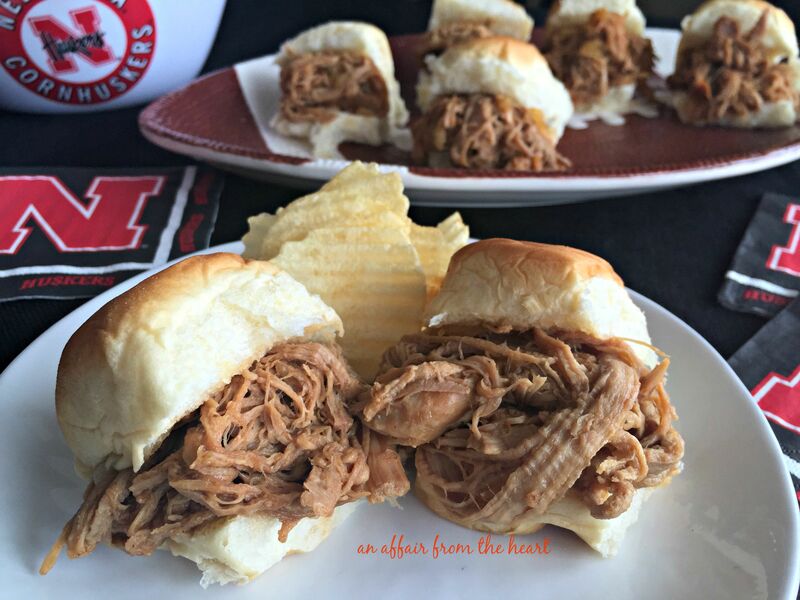 Shred and serve on Kings Hawaiian Rolls. When I made this recipe I cooked my pork roast in the oven and shredded it, THEN I added it to my crock pot in the morning with the rest of the ingredients to enjoy later that day. This would be a great way to use up left over pork, too! 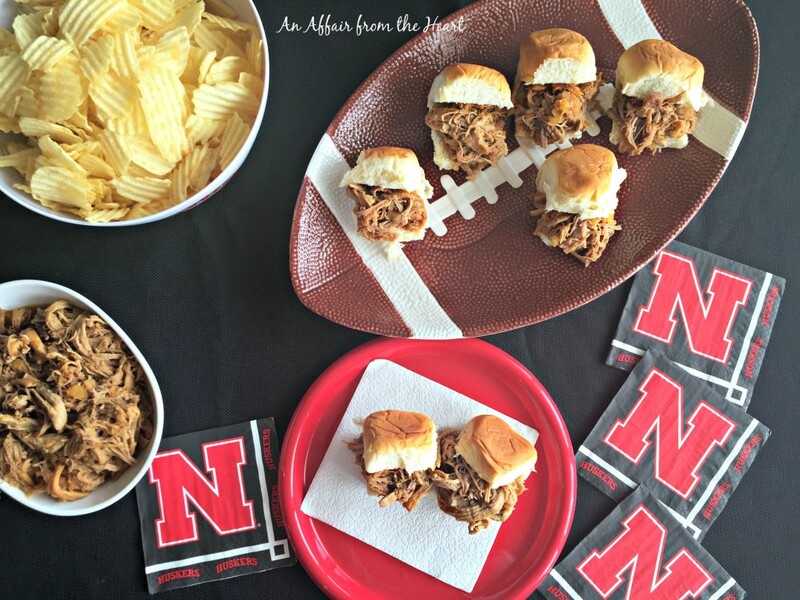 Want to see more from our fun Tailgating recipe swap? Find out what all of the other members of The Secret Recipe Club Made below! This theme is perfect for you!! These sliders look delicious!! I want to come to one of your tailgate parties. They sound like so much fun with the different themes. Not to mention I would be able to get one of these sliders. these are adorable, and the meat looks cooked to perfection, juicy and tender…. Can I come tailgate with you?! I love that you theme your tailgates. I always try to make dishes that fit my team’s colors but opening it up to the opposing team it a great way to add to my spread. Oh yum Michaela!!! 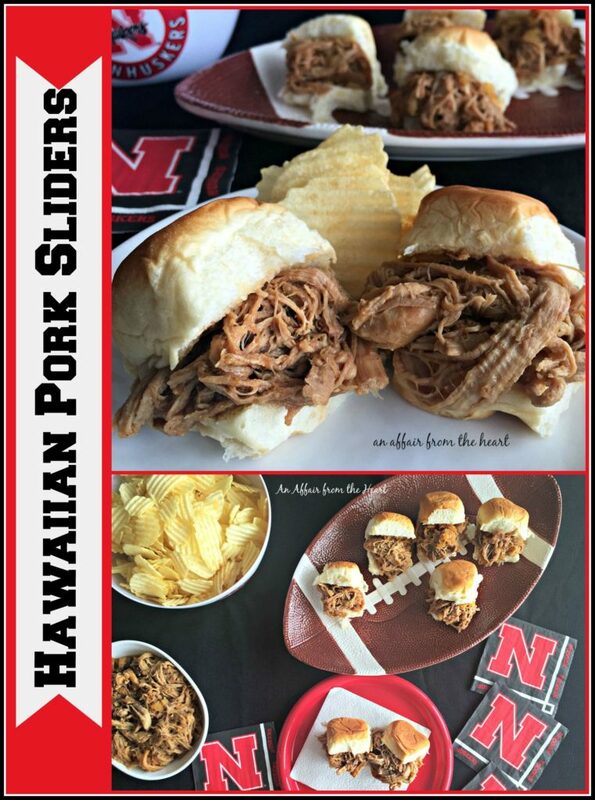 These look so good and the perfect snack for tailgating. So great cooking with you this month!! I love kalua pork and this looks fabulous. Great choice for reveal day! These look delicious! So easy too. My grandparents are from Shelton and are huge Cornhusker fans. I love your theming. Go Big Red!! 🙂 Thank you! Those look SO moist and delicious. Nice job. And I love your plates!! I’m so happy you enjoyed the Hawaiian Sliders..
A favorite in our house during football games. a Badger and Packer fan…your decorating skills would be hit!! Really?? I am sorry to see you go!! You have fantastic recipes! Thanks for this one, we love them! My Mother in Law is making them again!